Port Glasgow-based shipbuilder Ferguson Marine has successfully led a European consortium in a bid for EU funding support for the building and launch of the world's first sea-going car and passenger ferry fuelled by hydrogen. The supported development of the HySeas III ROPAX ferry is expected to cost around US$14.7m, of which US$10.9m has been awarded by the EU's Horizon 2020 research and innovation fund. The vessel's fuel will be produced from renewable electricity, marking a shift towards emissions-free marine transport around Scotland's Orkney coast. 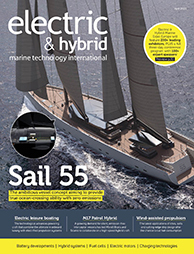 HySeas III, jointly led by Ferguson Marine and the University of St Andrews, includes Orkney Islands Council; Kongsberg Maritime; Ballard Power Systems Europe; McPhy; DLR - German Aerospace Center; and Interferry, the global trade association for ferry operators and suppliers. The initial objective is to construct and prove the vessel's modular drivetrain onshore, testing for stress and durability under conditions employing real-world data from existing vessels. If successful, the test will allow a vessel to be constructed and to operate in and around Orkney, which is already producing hydrogen in volume from constrained renewable energy. 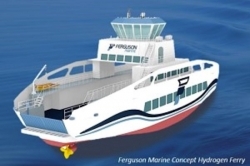 Ferguson Marine’s chief naval architect Chris Dunn, said: "In recent years Ferguson Marine has been at the global forefront of green marine propulsion technology development. This exciting project is yet another positive step on that journey and puts us firmly on track to deliver the world's first zero-emission, hydrogen fuel-cell powered commercial ROPAX ferry in 2020."